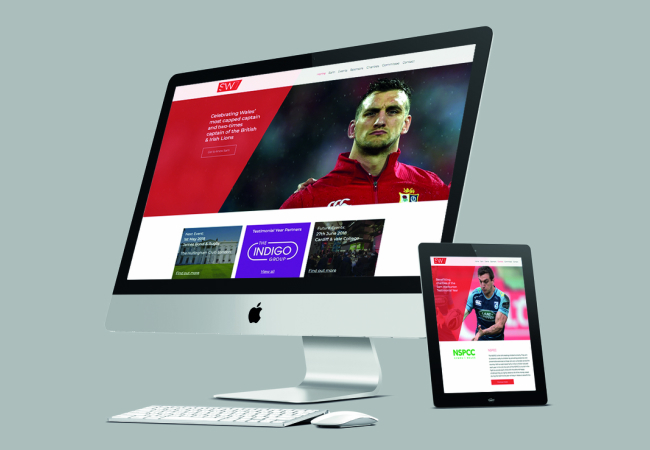 Following our support of former Wales rugby captain Gethin Jenkins’ testimonial in 2017, we’re proud to announce our appointment as web design and digital supplier for the Testimonial Year of Wales & Lions legend Sam Warburton. One of the most decorated players of his generation, and one of Wales’ all-time sporting greats, Sam is the most capped Welsh rugby captain in history, leading his country to Six Nations, Triple Crown and Grand Slam glory over the past decade. If that isn’t enough, he’s also skippered the British & Irish Lions on two successive tours: leading the Lions to victory in Australia in 2013 as well as a drawn series at the home of World Champions New Zealand in 2017. Achievements that have cemented his place as a global rugby star and recent recipient of the OBE. We originally worked with Sam, designing the ‘SW7’ logo for his 2015 charity dinner at the Principality Stadium, an event which raised more than £10,000 for the Velindre Cancer Centre in Cardiff, as well as a further £10,000 for the 'Stay Strong for Ows' campaign in aid of former Blues teammate Owen Williams, who suffered life-changing injuries while playing rugby. For the testimonial year, we’ve had the pleasure of designing and developing the official website, along with the design of a 64-page programme, to be distributed at each event. 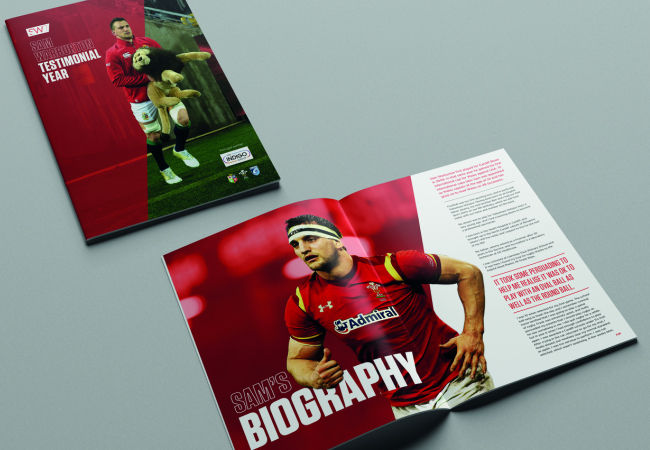 Within the pages of the programme you can find messages of congratulations from rugby stars past and present including Sir Gareth Edwards, Brian O’Driscoll and current Wales Head Coach Warren Gatland. In addition, there are well wishes from across the sporting spectrum, including former school-mates Gareth Bale (football) and Geraint Thomas (cycling) and Harry Kane and Mauricio Pochettino, from the Spurs team that he’s supported since childhood. The SW7 Testimonial Year got underway at the start of May with a star-studded James Bond themed event at the renowned Hurlingham Club in South West London. More events are scheduled throughout the year, across North and South Wales, as well as a charity dinner at Cardiff Arms Park, ahead of the 2019 Wales v England Six Nations fixture. We’re certainly honoured that all of the printed materials for each of the events will be designed by our team here at UpriseVSI. The Sam Warburton Testimonial Year is supported by WRU and Cardiff Blues. The committee is led by Chairman, Hywel Peterson and also features UpriseVSI's Design Director, Geraint Manning.